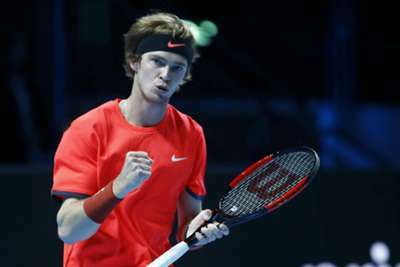 Andrey Rublev and Jaume Munar reached the Next Gen Finals last four with wins on Thursday, joining Alex de Minaur and Stefanos Tsitsipas, who both have 100 per cent records. Russian 2017 finalist Rublev was outclassed by De Minaur on Wednesday but bounced back 24 hours later, following the Australian through from Group B.
Winless wildcard Liam Caruana went down 4-3 (9-7) 4-1 4-2 to leave Rublev far more satisfied with his performance as he approaches a semi-final against Tsitsipas. "This was a completely different performance," he said. "My attitude, I think, was the best attitude out of these three matches. "I was focused. I was not complaining. I was trying to fight for every point because I know that every point for me costs a lot. I was just trying to win each point, every point, doesn't matter the score." De Minaur was similarly dominant as he won his third straight match in Milan after a shaky first set, defeating Taylor Fritz 4-3 (10-8) 4-1 4-2. "I'm really proud of my effort and I'm looking forward to what's next," De Minaur said. And Munar completed the last-four line-up as the already-qualified Tsitsipas beat Hubert Hurkacz 4-1 4-3 (7-2) 4-1 in the day's late game. Hurkacz still had the opportunity to progress ahead of that clash, but he was blown away and Munar - who ended Frances Tiafoe's hopes earlier on Thursday - instead went through. Munar had joked after a rampant 4-1 4-3 (7-3) 4-1 triumph: "I did what I had to do and it's not in my hands anymore. Maybe we can buy a Greek flag or whatever for support."